YAY!! 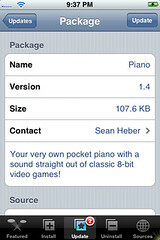 This update to Piano is exactly what I have been waiting for!!! I’m sooooo excited. 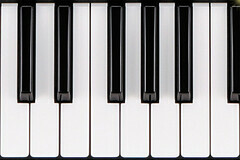 The weird staticy noise is now gone and the piano sounds great! 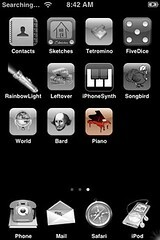 I can even play more then one note at a time. Sean is really on the ball tonight…great job! There has just been an update in installer.app to today’s iApp-a-Day – Piano. 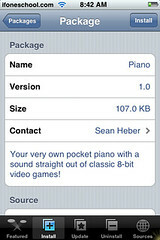 The update vastly improves the sound of the piano…instead of the video game tones you once heard…it now sounds much more like a piano. 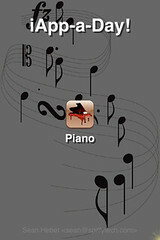 I did find that you can only play one note at a time now. Before the update you were able to play two notes at the same. And for some reason I am still getting the weird staticy noise every time I play a note. 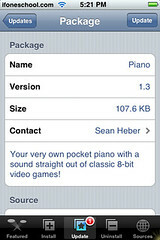 But, I like the update…I much prefer the new sound of the piano…good job Sean.